In June of this year I got the opportunity to try some Brock Beauty products, including Infinite Lash, Essentious Shampoo and Conditioner and the well-known Hairfinity Hair Vitamins. To give a genuine review of Hairfinity and Essentious products, I have to start from the very beginning. I purchased and started taking Hairfinity hair vitamins in the spring of this year, but after one and a half bottles, I stopped. Mostly, because I'm not very good at keeping up with a daily anything, and also because I did a poor job of documenting any growth I might have noticed if I had done better. Then, I started again in mid June, when I received all the Brock Beauty products to try. The results have been a bit difficult to see so far, because my hair is so very coily! I also have a bad habit of getting scissor happy when I don't like the way my ends feel. Sometime in June, I cut off a lot on my ends, and I also got a good trim on the back and sides of my hair at the beginning of July. I know that I had an index finger's length of hair that was a chemically texturized around March, and today, 6 months later, after all the cutting and trimming, I have all natural new growth that has grown to about the same length. That's about 4.5 inches of growth in 6 months, which means that my growth hasn't necessarily been exponential, but it has been more than the average, steady 1/2 inch per month, especially when you take into account all the trimming. Also, in the back, where I cut it down to a half inch to one inch at the beginning of July, it is already about 1.75 to 2.5 inches, which means I'm getting a solid half inch every month, and I'm happy with that! I also have a sneaking suspicion that all those lovely ingredients have had a wonderful effect on the way my hair feels. 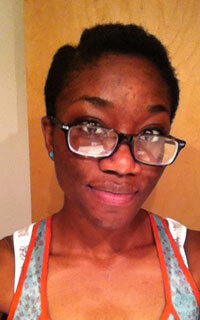 Overall my hair tends to feel softer and more manageable and moisturized than it ever has. It also looks more full and shows less and less of my scalp when I do twist-outs. 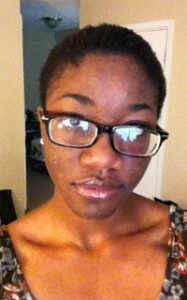 That used to be a major problem after my first big chop. I had let my hair grow a little longer then, but it was not as full as it is today! I have two patches of thinning hair that I believe are due to damage from when I used to relax. I can still see my scalp, and some of it is very fine baby hair near my hairline, but seems a little thicker and longer there than before. I know that isn't only due to what I put on the outside of it. 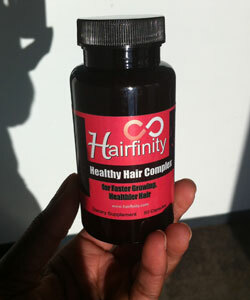 Now, I want to take at least a month or two and carefully track my growth with the Hairfinity Vitamins. Then, I will report back with more fabulous results! This time I will be using my hair color as a marker for my growth, as I got my hair colored on September 6th and a new round of Hairfinity vitamins around the same time. When I looked up the ingredient lists for these line of Essentious products on their website, I was pleased to find a very natural line-up of ingredients in each. Here's my honest review of them. I'm not usually big on using shampoos because my coily, springy hair is naturally dry and wiry. It needs all the moisture it can get, so I usually prefer to use cleansing conditioner. That's why I was honestly not that excited about trying the Essentious Exonerate shampoo, gentle or not. I don't wash or co-wash more than once a week, but since I sometimes use products with silicones, I do have a need for something stronger than a cleansing conditioner to remove buildup every once in a while. When I read that there are no harsh sulfates in the Exonerate shampoo that would strip my hair of natural oils, it raised my hopes a little higher, and I tried it out. After washing my hair with Exonerate, I could tell that the buildup had been removed and my hair and scalp were left feeling clean yet not dried out or tangled. My hair is pretty short, so I usually don't need a lot to begin with, but I still got the impression that a little bit of Exonerate goes a long way. I only needed to wash once for that satisfyingly clean feeling. If your hair naturally dry or very coily hair, I would recommend this shampoo only for times when you need to effectively remove days or weeks of buildup without losing the barrier of moisture that you have built up around your hair. If you have looser curls that like shampoos, you could probably enjoy using this shampoo twice or more a week. 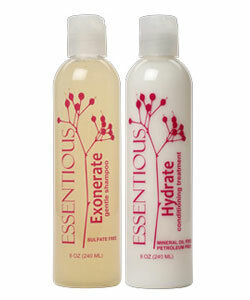 Right after rinsing out the shampoo, I massaged in the Essentious Hydrate Conditioner. It had a pretty thick consistency that those with finer strands might not appreciate. My hair, somewhere between medium and fine, happily soaked up the moisture from the Hydrate Conditioner, so I gave it a little more. Although Hydrate is pretty thick, my hair seemed to hold on to the moisture from it. 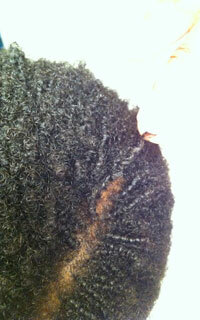 It was easy to work into my hair for a great detangling experience. Conditioners are my go-to product of choice, but what I hate the most, is a thick, un-spreadable conditioner that sits on my hair and then leaves it drier than when I started. Hydrate proved to be the opposite of this. My hair felt super soft and slick (in a very nice way) after cowashing with the conditioner and using some leave-in conditioner mixed with vegetable glycerine. Even in the dry air conditioned office, my hair felt really wonderful which is never the result of just using leave-in conditioner with glycerine, so it must have been from using the Hydrate conditioner. I couldn't stop touching my hair that day! Because Hydrate does contain proteins, it should make a good strengthening and moisturizing rinse out conditioner. As much as we curlies love to leave in a little conditioner, I would not recommend using Hydrate as a leave-in. Any buildup of protein in your hair may leave it feeling dry and straw-like. I tried it as a leave in mixed with vegetable glycerin and the results were okay, but the most benefits of the conditioner seem to come with massaging it in and then rinsing it out. If you're looking for a way to do a beauty makeover, I would recommend giving Brock Beauty products a try. My favorites out of the ones I experimented with were the Hairfinity Hair vitamins and the Infinite Lash serum because they produced the effect of a dramatic makeover with my own natural hair and lashes! Besides, who doesn't enjoy a good before and after story? Interested in trying out Hairfinity or Essentious? You can find out more at hairfinity.com and essentious.com.